Scientists are still not exactly sure what causes rosacea. Hypotheses include upregulation of the immune system, sun exposure, increased stimulation due to blood flow, sensory nerve upregulation, and increased sensitivity to Demodex mites which are found on normal skin. According to a survey published by the National Rosacea Society, 81 percent of patients named sun exposure as a top trigger for rosacea flare-ups. Sun exposure is also linked to the increased visibility of blood vessels and the severe redness that occurs with rosacea. Regardless of whether the weather is sunny or cloudy, everyone needs daily facial protection from the sun, and this is especially true for rosacea patients. Over time, incidental sun exposure from riding in a car, sitting near windows, or simply walking outside can be just as damaging as a day in the sun. Likewise Moisturizing Defense contains a high concentration of micronized zinc which blocks, rather than absorbs, the sun's rays. 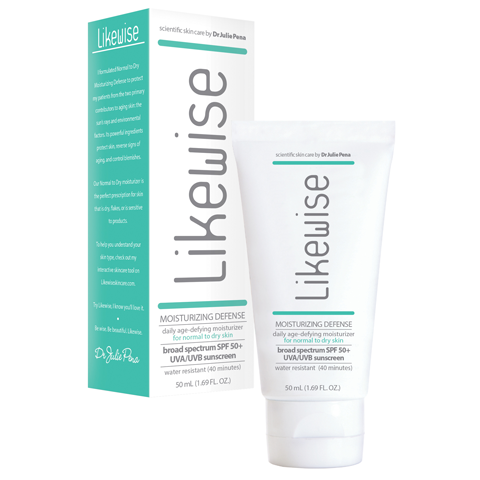 This unique SPF 50 product also contains niacinamide which calms redness. Use fingertips to wash face with lukewarm water and soap-free cleanser. Apply a sunscreen moisturizer which provides both UVA and UVB protection. Those containing zinc oxide and/or titanium dioxide are well tolerated. Use cosmetics and sunscreens which contain protective silicones (dimethicone). Avoid astringents, toners, and exfoliators. Avoid products containing alcohol, menthols, camphor, witch hazel, fragrance, peppermint, and eucalyptus oil. Avoid using makeup that is difficult to remove.